In the case of shoulder pain and dysfunction, the lower trapezius and serrates anterior are often implicated as part of the problem. Research has shown that these two muscles often fatigue and don’t contribute equally to the force couple between them and the upper trapezius that facilitates upward rotation of the scapula. Building scapular stabilization and dynamic stability is a must for those doing repetitive overhead activities such as throwing, swimming, serving, or work-related tasks. It is a given that asymmetries will exist, so optimizing the strength of the rotator cuff and scapular stabilizers is paramount to prevent injury and recover from overuse syndromes. 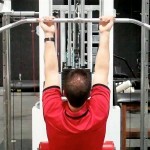 To strengthen the lower trapezius, one of my ‘go to’ exercises is the lower trap raise. It can be done with just the weight of your arms or using light dumbbells. The link below includes the full description for the exercise, and I also embedded the video below. In the next column, I will include a serratus anterior exercise using a kettle bell as a follow-up to this post. One of the most common issues I see in the clinic with active exercise enthusiasts between the age of 20 and 55 is shoulder pain. Weightlifting has been popular for ages, but Crossfit is all the rage these days. Both disciplines involve overhead lifts. 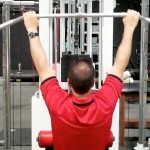 The key thing to remember when performing overhead repetitive lifts is how load and stress not only affects strength and power, but how it impacts the joint itself. 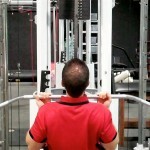 Pull-ups and pull-downs are staples for most clients I see. As a therapist and strength coach, I am always thinking and analyzing how variables such as grip, grip width, arm position, scapular activation, trunk angles etc influence exercise and how force is absorbed by the body. 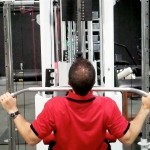 One such exercise I have spent time studying and tweaking is the lat pull-down. 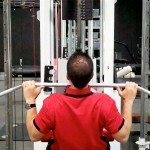 It should be common knowledge for most, but I will state it for the record anyway – you should NEVER do behind the neck pull-downs. Beyond the horrible neck position, this places the shoulder in a dangerous position for impingement and excessively stresses the anterior shoulder capsule. A wider grip (be it with pull-ups, pull downs, push-ups) will always transfer more stress to the shoulder joint because you have a longer lever and greater abduction and horizontal external rotation. So, what bearing does this have in relation to the rotator cuff and SLAP injuries? For more information and details on the application of the grip choice, click here to read the full column I did for PFP Magazine this month. Stay tuned for my next post (a follow-up to this one) one of my Crossfit patients who now only has pain with overhead squats and how my differential diagnosis and rehab has led me to conclude what is wrong with his shoulder. Keep in mind we must learn to train smarter so we can train harder and longer without pain and injury. Biomechanics and understanding your own body really does matter. Full Can vs. Empty Can Exercise? The number of people struggling with shoulder problems is astounding. 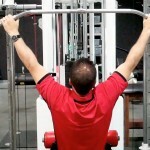 Keep in mind 36% of people working out will develop a shoulder problem. 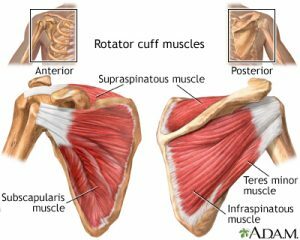 For those suffering from persistent shoulder aching/pain or a known rotator cuff issue, you will want to check out this video. I have also pasted a link to a column I wrote on this very topic for Personal Fitness Professional Magazine as well.